Teresa finished her Bachelor of Health Science (Physiotherapy) at the University of Sydney in 2014 and has gained experience as a graduate from a wide range of clinical areas both at Royal North Shore Hospital and Mona Vale Hospital. Combining her genuine love of helping people and problem solving, Teresa has found physiotherapy both challenging and rewarding. Having been a sporty child – trained in sports acrobatics, it was in undergoing physiotherapy herself after an injury that she decided that she wanted to pursue this as a career. Teresa is a certified ConnectTherapyTM practictioner and continues to have a desire to always learn and challenge herself in developing new clinical skills. 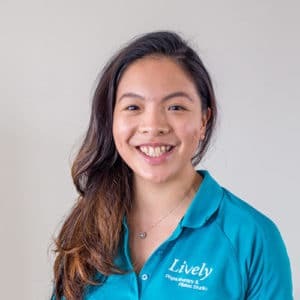 In addition to completing the ConnectTherapyTM ‘Sports Thorax’ short course and ConnectTherapyTM Series, she has completed a dry needling course, and also has formal training in Muscle Energy and Mulligan’s techniques. She also is a qualified Pilates instructor having graduated from Polestar Pilates Australia. Whilst balancing full time work, she is due to finish Masters of Public Health at the end of the year with a vision to address Australia’s chronic health issues especially sedentary lifestyles in the workplace. In her spare time, Teresa loves singing in her acapella choirs, hot yoga, dancing and going to the gym. Teresa works full-time. She is available for Physiotherapy treatment on Tuesday afternoons, all day Thursday & Saturday mornings. She teaches PEP sessions on Monday afternoons, Tuesday morning and afternoon, Friday morning.